Matt Hagan begins defense of his 2014 NHRA Funny Car world championship this weekend armed with his typical optimism and a new body, courtesy of his manufacturer. Hagan’s offseason included a visit to the Fiat Chrysler Automotive headquarters in Auburn Hills, Mich., where the 2015 Dodge Charger R/T carbon-fiber body he will campaign during the Mello Yello Drag Racing Series was designed and brought to life over the past year. Hagan will debut his new flopper Friday during the first two of four rounds of qualifications for the 55th annual Circle K NHRA Winternationals. The event at historic Pomona (Calif.) Raceway is the season-opener of the 24-race schedule. Hagan scored four national event victories and two runnerup results in 2014 en route to a 43-point finish over John Force, the 16-time world champion. After qualifying sixth in last November’s Auto Club Finals, Hagan defeated Force in the final round after clinching the world championship in the semifinals. Hagan ramped-up his driving with three victories during the six-race Countdown to the Championship playoffs, including the season-ender at Pomona Raceway. The native Virginian posted a 39-20 won/loss record highlighted by a class-best 18-3 during the playoffs. 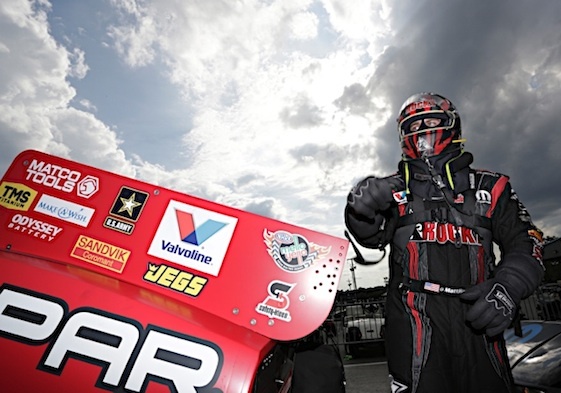 Hagan, who won his first Funny Car title in 2011, has rolled into Southern California as National Dragster’s 2-1 favorite to repeat as world champ. Hagan and the team led by crew chief Dickie Venables and assistant Michael Knudsen are winless in the Winternationals but have advanced to championship rounds the last three times they’ve raced at Pomona. Hagan has, however, earned Wally trophies at the past two Auto Club Finals in November. In all three finals Hagan faced-off against archrival Brute Force. During a December 2014 test session in Florida, Hagan’s Dodge recorded the unofficial quickest run ever by a Funny Car with a 1,000-foot time of 3.954-seconds at 323.97 mph. Former Funny Car world champion Jack Beckman heads into the 2015 NHRA season determined to snap a 51-race winless streak. To that end, year-long funding for Beckman’s new 2015 Dodge Charger R/T was secured in December when Terry Chandler committed to back her second Funny Car team at Don Schumacher Racing. Chandler has added Beckman’s team to the financial backing already planned for Tommy Johnson Jr. and his Make-A-Wish Dodge. Beckman’s team plans to announce a major sponsor during this weekend’s Circle K NHRA Winternationals. Meanwhile, team-owner Don Schumacher scored a major coup by hiring former world champion crew chiefs Jimmy Prock and John Medlen, both formerly of John Force Racing. Prock is Beckman’s crew chief with Medlen serving as assistant crew chief alongside Chris Cunningham, the only holdover from “Fast Jack’s” winless 2014 team. “I’m terrible with names, and I’ve never learned names this fast,” said Beckman, who won his 15th and most recent national event during his 2012 title season. “There is an immediate comfort level. Most of last year’s crew went to other DSR teams and they’re going to get into some winner’s circles this year. Beckman finished 11th in points in 2014, failing to qualify for the six-race Countdown to the Championship for the first time since the playoff format was instituted in 2007. Alan Johnson Racing reportedly has entered former Top Fuel world champion Shawn Langdon in the first two events of the 2015 NHRA Mello Yello Drag Racing Series season as it continues to search for a full-time sponsor. The team announced on Jan. 5 that Qatar Racing Club was terminating its funding to the team. With the separation from Al-Anabi Racing, team-owner Johnson released 2014 Winternationals champion Khalid alBalooshi. Brian Husen and Jason McCulloch are serving as co-crew chiefs on the AJR Racing dragster booked for this weekend’s Circle K Winternationals and the 31st annual Carquest Auto Parts NHRA Nationals in Chandler, Ariz., Feb. 20-22. Beyond that, Langdon’s season is in question. Langdon won one race and posted five runnerup finishes in 2014 en route to a fourth-place point finish after the six-race Countdown to the Championship. Langdon compiled a 35-23 won/loss record last season, but only 7-6 during the playoffs. With considerably less fanfare than A Man Named Force, Pro Stock veteran Larry Morgan has switched brands heading into the Circle K Winternationals. Morgan’s five-year (2010-2014) association with Ford Motor Company ended last November without a victory. Morgan will begin his 29th season of Pro Stock racing in a Chevrolet Camaro built by Jerry Haas with engine power provided by Gray Motorsports. “You can tell the rest of the Pro Stock guys to stay home!” said Morgan, driver of the FireAde Camaro. “No, I wish it was that way, but my guys and Johnny Gray’s guys are working real hard on my car and on engines.” Morgan drove Ford Mustangs during his tenure with the Blue Oval.